The idea of marketing your green industry business in the digital space is pretty easy to understand and comprehend. 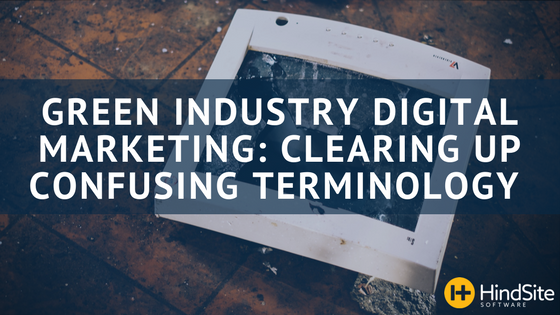 But when it comes to digital marketing terms, it can get confusing - in a hurry. This confusing nomenclature knows no boundaries, whether it’s a college kid majoring in marketing or someone who couldn’t care less about marketing, it can make anyone’s head start spinning. So we’ve accumulated some of the most useful terms for your business in attempts to clear up the digital haze affecting all of us. ALT Text: A description of an image in your site’s code. Humans see a picture, but search engines read the ALT Text behind that picture. Have ALT Text on all images on your site. Anchor Text: This is the text that is shown when you create a link on a page. Normally the text is underlined and blue in color. Search engines use Anchor Text to understand what the destination page is about. Blog: A blog is an important part of your website. Each blog post becomes a new page within your website which has an opportunity to be found in search engines. For local SEO, it is important to keep a current, unique and helpful blog that your visitors will love. Conversion: This typically refers to a visitor taking the desired action while navigating your website (or blog) such as purchasing a product or service, filling out a form, downloading or registering. Directory: Think of these as phone books for websites back when phone books were relevant. Online directories can be websites like Angieslist.com or Yelp.com. Domain: www.YourGreenIndustrySite.com is an example of a domain. It is the main web address of your site. Domain Authority: Used by search engines to determine how authoritative a company’s website is. It’s a 1-100 scale with 1 being the lowest rank and 100 being the highest. The more search engines that trust your website the higher your domain authority. The Fold: This is a term referring to the point on a website in which you can no longer see without scrolling. It is important to keep information that you want visitors to see right away “above the fold”. It can also refer to where you fall in search engine ranking. Headings: This is text on your site that is placed inside a “heading tag” in your website’s code. It usually looks more prominent than other text. Indexed Pages: The pages of your website that search engines store. Inbound Links: A link from one site going into yours can help your SEO. But remember, do this by creating awesome content, not by buying these links. Link Building: The process of gaining more inbound links to your site. This will improve your search engine rank when done correctly. Metadata: The data about data. This tells search engines what to expect from your website. Meta Description: This is a description of 160 characters or less on what a webpage is about. It doesn’t directly affect SEO, but a well written Meta Description can entice visitors to click on your listing. Paid Traffic: When a company bids on certain keywords and makes advertisements around these keywords to be placed (when they’re searched) on the search engines. You’ve probably noticed them at the top, bottom or side of a search result page. Generally, it also refers to any form of paid advertisements that directly points to your website. Page Rank: A number on a scale of 0-10 that Google uses to tell you how good your SEO is. SEO: Search engine optimization is the practice, tactic and concept of improving your website for both visitors and search engines which results in you ranking higher in organic search results. Sitemap: A document that shows all pages of your website. This gets indexed by major search engines. Most websites will have one in their footer.